Have you been searching for the World’s Best Strawberry Chia Seed Jam? Well congratulations my friend, you’ve found it! There are many recipes for Strawberry Chia Seed Jam out there, but this one is the best I’ve tried! The rosé vinegar gives the jam a perfectly tart flavor that pairs so well with the strawberries, you’ll wonder why you’ve never tried this combination before. It’s soooooooo good. 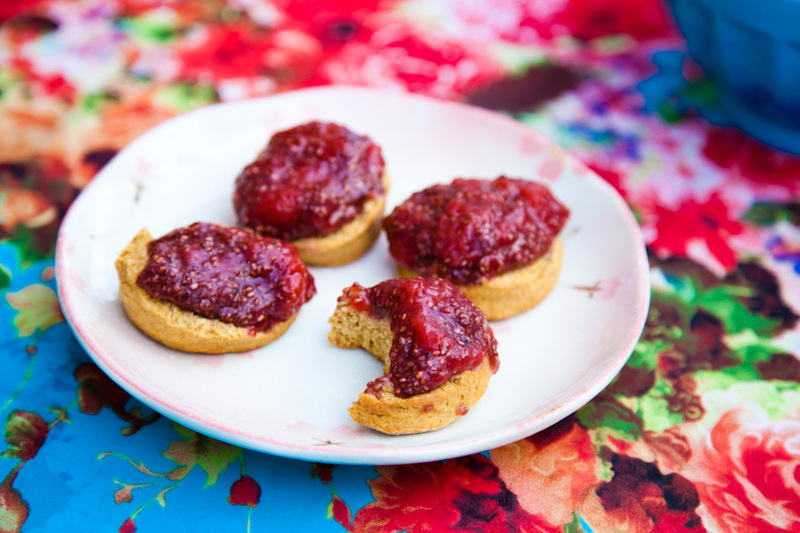 If you’ve ever had dreams of vegan strawberry shortcake, this jam is for you! A generous spoonful of this strawberry chia seed jam on a biscuit smeared with coconut oil is pure heaven, if you ask me. It’s incredibly easy to make and it can last up to two weeks in the fridge, although it usually gets gobbled up in a day or two in my house! Heat a sauce pan on medium high heat. Melt the coconut oil on the bottom of the pan. Add the frozen strawberries. Keep the heat on medium to medium high heat while stirring every minute or so to keep the pan from sticking. Once the strawberries have thawed, mash them with a fork or potato masher until they are mostly smooth, but a bit chunky. Stir in the maple syrup and vinegar. Mix well. Let the jam come to a boil for a few minutes until it begins to thicken. Place the pan in the freezer for ten minutes until it cools slightly. Add the chia seeds. Mix well. Set aside for 20 minutes to thicken, then slather a biscuit with coconut oil and a huge spoonful of jam. Did you make the World’s Best Strawberry Chia Seed Jam? We wanna see! Post a photo of your creation on Instagram with the tag #carrotsandflowers 🙂 It will make our day! For other tasty breakfast options, check out our Gluten-free Mushroom Gravy or our Baked Polenta with Mushrooms! I was wondering, can you just use fresh strawberries and add them already semi-blended to the pot, just to save on time? would the end result be the same? either way I have to give this a try. looks really good. Hi Maria! If you use fresh strawberries, that should work and taste delicious! I would try mashing them up a bit though so they break down nicely into jam. Hope it turns out well for you! !